Cleveland smog in the 1970s: The China of its day. Smog in Cleveland, July 1973. 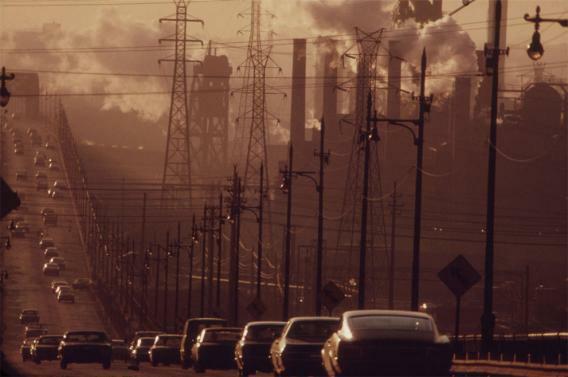 For a bit of context for stories you see about air pollution in major Chinese cities these days, you should look up some photos of major American cities in the 1960s and 1970s before the Clean Air Act and deindustrialization really struck. Dina Specter has this from New York in 1966, and a photo essay the Atlantic ran last year about America in the seventies featured the NARA photo of Cleveland that I’ve run above. The looming climate crisis tends at times to obscure the fact that really staggering gains have been made over the decades in other aspects of environmental policy, and that the crazy pollution you see in China isn’t some unprecedented thing nearly as much as it is a case of the PRC simply replaying the western experience of industrialization without adequate regulation.